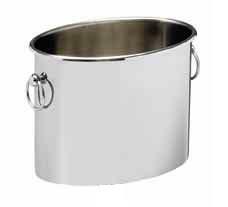 Timeless Champagne Tub in heavy duty 18/10 stainless steel with easy-to-carry handles. Carries 4-6 bottles. Matching stainless steel champagne bucket stand.